27 years of success confirm the importance of the event for great businesses in franchising. 89% of exhibitors point to ABF Expo as the best entrepreneurship fair in Latin America. 95% consider that attending the event is good or essential for their business. Enterprises consider ABF Expo the fair with the best business opportunities in the sector. Microfranches have had further highlight at ABF Expo 2019. With 98.000 m² of infrastructure and international quality standard, Expo Center Norte has an impeccable state-of-the-art infrastructure for all kinds of events, in a privileged localization. With 5 pavilions for fairs with air-conditioning, Expo Center Norte is the perfect place for fairs, conventions, graduation parties and corporative events. 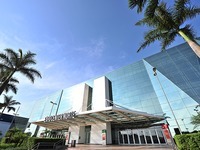 Expo Center Norte is located in a area with fairly good transportation links, next to the main bus terminal in São Paulo, the Tietê Bus Terminal. The region also counts with varied options of accommodations, conveniently located just a few minutes driving from the venue. There are two shopping centres (Shopping Center Norte and Shopping D) quite close to the venue, but if you are looking for more options of nightlife and restaurants, you may want to find a hotel close to Av. Paulista area, which is about 20-30 minutes by car from Expo Center Norte.